I know this isn’t anything crazy BUT its something that eats away at me at times and can really drag me down. You see, I’m not perfect. I try to keep everyone happy. I try to balance it all even tough I know I can’t. I try to keep organized, and fail. I love the theory of minimalism, but I have too much stuff. I’m a health and fitness coach, who is gaining weight and eats too much sugar. I’m a Christian who doesn’t spend as much time in the Bible as she should. I’m a mom who yells… and cries. I lead more than I follow. I fear things I shouldn’t. I could go on for a while, but I’ll just stop there before I get depressed….oh that is another one I struggle with depression. ANYWAY…with the social media showing everyone in their perfect put together worlds with just the right lighting and angles, its hard to accept reality sometimes. I catch myself taking ‘do-over’ shots of a moment or cleaning up my room before taking a picture (ok is it really so bad that social media is encouraging me to clean?) instead of recognizing that life is great the way it is. Perfectionism is a struggle for me. For now my goal is to just improve, to acknowledge in the moment that it doesn’t have to be perfect. My friend doesn’t like me any less because my house was a mess when she stopped by last night. I want to be able to move on when I get stuck in the cycle of chasing perfection. Life is hard enough the way it is I don’t need to add one more thing to the pile. How about you? 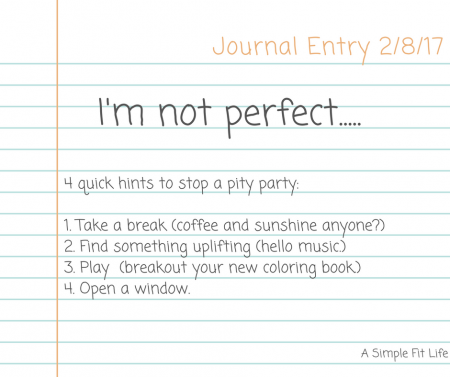 Do you struggle with trying to be ‘perfect’?